In our February-May 2016 issue of SAM Magazine, our member-only publication, we featured an interview with indigo textile artist Rowland Ricketts in anticipation of our upcoming exhibition Mood Indigo: Textiles From Around the World. Our space was limited in print, so we’re featuring the whole interview here on the SAM Blog. The upcoming exhibition heading to the Asian Art Museum, Mood Indigo, honors the unique ability of the color blue to create many moods in cloth. Drawn primarily from the Seattle Art Museum’s global textile collection, Mood Indigo illuminates the historic scope of this vibrant pigment. The exhibition features a set of tapestries from Belgium, a silk court robe from China, a vast array of kimonos from Japan, batiks and ikats from Indonesia and Africa, and ancient fragments from Peru and Egypt. 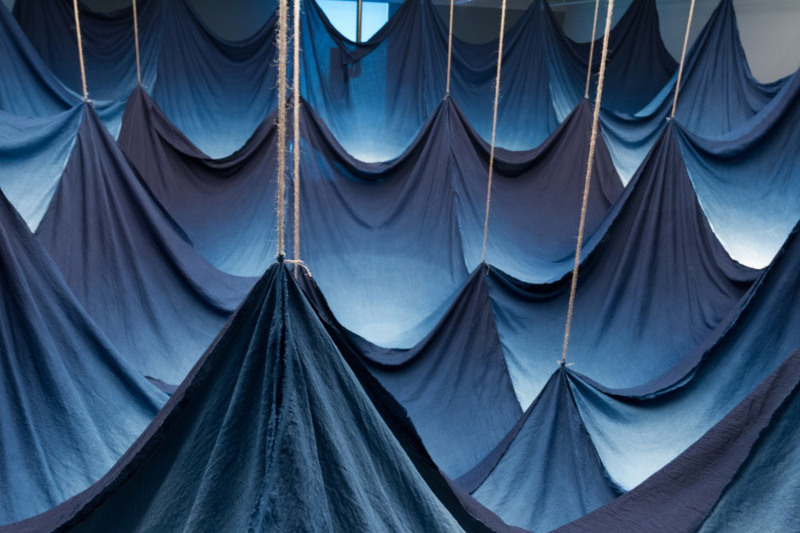 An immersive contemporary installation devoted to indigo by Rowland Ricketts will be accompanied by a soundtrack by sound artist Nobert Herber that unveils the musical nuances indigo can suggest. From the sultry darkness of midnight to the vitality of a bright sky, come let the myriad blues in their multiple forms surround you. Artist Rowland Ricketts adapts historical processes to create contemporary textiles. He came to indigo by way of a two-year apprenticeship in 1996. 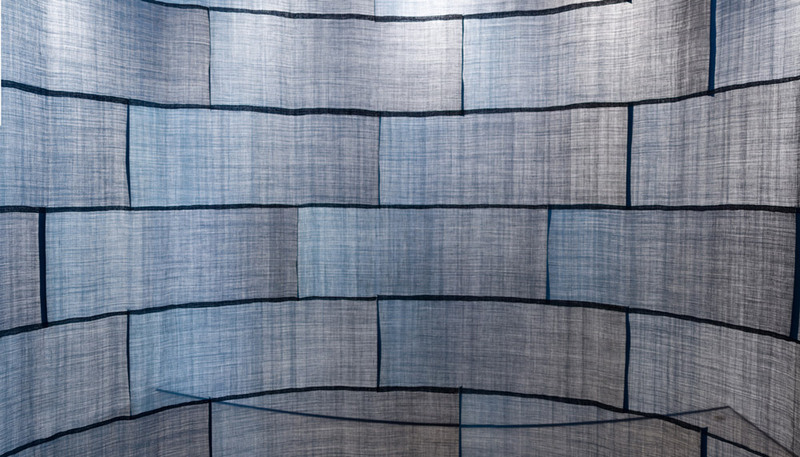 Today, Ricketts works with his wife and fellow artist, Chinami, as they handle indigo in all the stages of its inception: growing, processing, vatting, and dyeing. 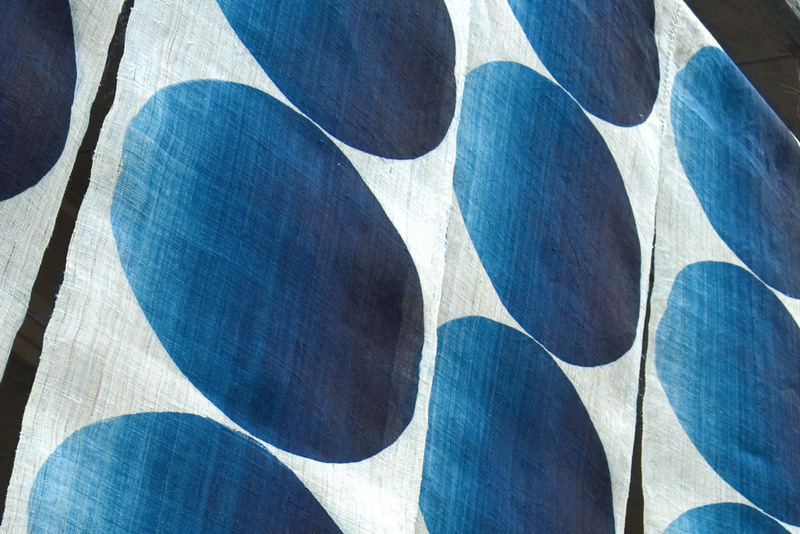 Read on to learn about this artist’s journey with indigo, from seed to cloth. SAM: Hi Rowland! Thanks for speaking with us. SAM: What would you say your work is about at the heart? What are the central themes inherent in it? Ricketts: On some level, it’s awe and wonder. That is a huge, meta-interest for me. Indigo is imbued with mystery. It’s an enigma of sorts in that it is a dye found throughout the world, and a dye found in synthetic forms. People have been drawn to it for millennia, working with it for millennia, and the end of the day, the color is immaterial, a wavelength of light. There are myriad connections indigo, from history, to plants and the environment, to art, time, etc. 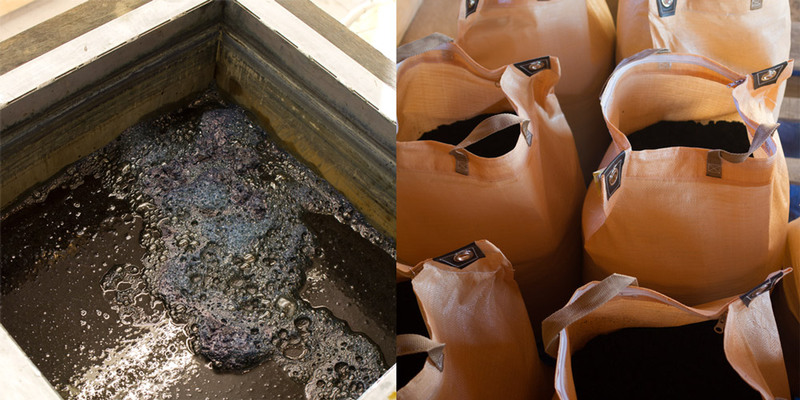 We (indigo makers) create these connections and at the end of the day, we’re making something immaterial. Part of the human condition is the drive to create beauty, and yet it is so immaterial. It’s all part of the bigger picture. 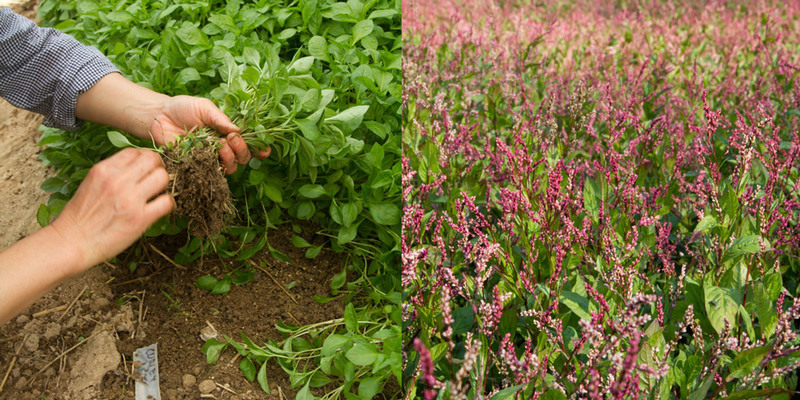 On a smaller scale, planting, harvesting, and dye-making are all central to what I do. SAM: What inspired you to work with indigo? When did you start? Ricketts: In 1996 I did a two-year apprenticeship in Japan, and spent one year working with a farmer and one with a dyer making indigo out of composted leaves. What inspired me was that I didn’t know what I wanted to do yet. I did photography, taught high school, and was developing black and white photos. I stopped eventually, pre-digital photography. I thought that there’s got to be more ways to create. I met people who were very conscious of their environment, very direct with it. I met them folks who dyed indigo, and worked with them on plants. They first told me about indigo and said to visit the Folk Art Museum in Osaka. When I went, there happened to be an indigo dyer exhibit up. I just started gardening and thought, “Wow, this is what I want to do.” It brought together my interests: working in a sustainable way with the environment, gardening, and farming. SAM: Tell us about the work that you’ll have on view as a part of Mood Indigo. Ricketts: The installation was a part of an exhibition at the Museum of Fine Arts Boston (Crafted: Objects in Flux, which was on view through January 10, 2016) and it will be reconfigured to fit the space. It’s coming SAM’s way next. It’s called “Mobile Sections.” For it, I collaborated with a sound artist, Norbert Herber, for an audio component. It’s made up of a large, indigo-dyed textile, 11½ ft. tall by 30 ft. circumference, dried indigo plants, and possibly a video projection. The inspiration for it was drawn from the process: field recordings of the harvesting, planting, drying, and positions of sound. It is playing with materiality and immateriality and it’s a thing that’s so much bigger in person. SAM: For those of us who have yet to dye things with indigo, can you walk us through your indigo-making process? I plants seeds in late March, and transplant seedlings in early May and tend them, then harvest them in early July by cutting at the base to allow the leaves to dry. In the fall, these dry indigo leaves are put in a special shed, mixed with water, and composted for one hundred days to make the traditional Japanese indigo dye-stuff known as sukumo. 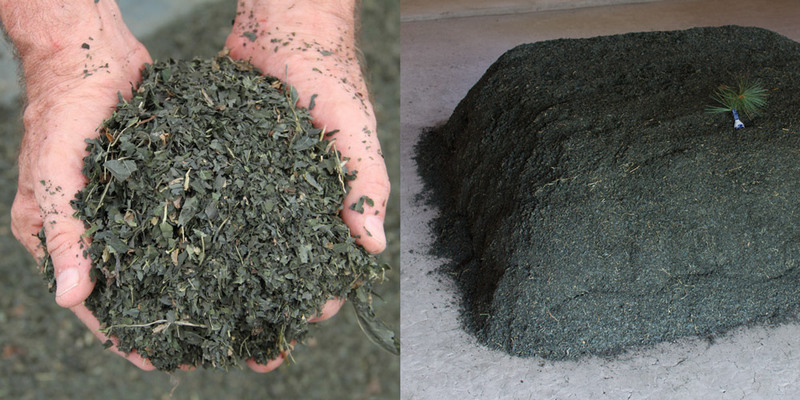 By January, a concentrated compost with dye is left behind. To dye cloth, I take the composed leaves, add wood ash lye, and mix them. 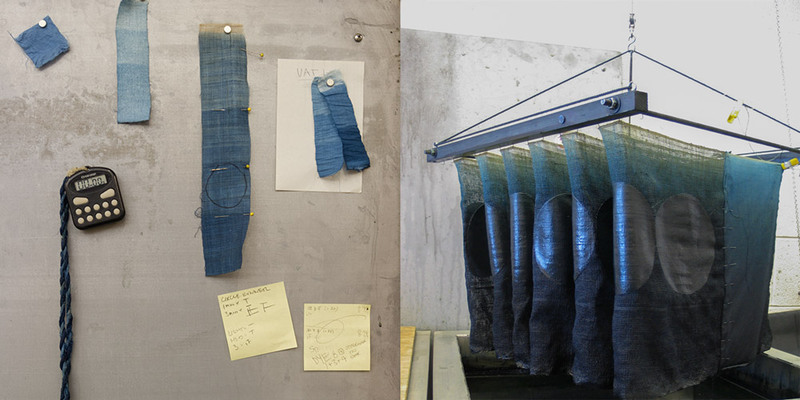 Indigo bacteria removes oxygen to make the dyeing possible. The dye lasts from four months to a year, and the leaves used to make the dye are returned to the fields to nurture the next planting. With this process, the only thing taken from the leaves is the dye. SAM: Okay, last question: What do you think people should know about indigo? Ricketts: One connection people should definitely make: that the color they’re seeing comes from plants. I grew up in suburban America, and was driven by cars. I only became interested in plants after living abroad. People have been making indigo for millennia! I hope that after they leave the installation visitors think about what the color is, where it came from, and how it got there. Mood Indigo will be on view at the Asian Art Museum April 9–October 9, 2016. Don’t miss it!